Holy cats. This book is just amazing.Although it is triggered for a younger audience, I feel like everyone should give it a try, beacuse why not? Especially if you're a cat lover, this is something you shouldn't miss. Being completely honest, at first I was about worried not liking this book, but all my worries dissipated as Billy's story moved forward. This is one of a very few books that made me feel nostalgic, and I didn't want it to end, hmm, beacuse nostalgic *sniff* The beautiful writing style gives you such a well crafted contexture, the plot is equally exhilarating. Billy, our main protagonist is just so relatable and lovable. There were times where I just wanted to hug him. I think anyone who has ever felt lonely would find Billy immensely relatable. The pace of this book is quick and it keeps you on your toes. I simply love it. Can't highly recommend enough. Original Blog Review: https://myescapebookscoffeetea.wordpr...My Instagram: http://instagram.com/blog.myescape/ My Twitter: https://twitter.com/BlogMyEscape Buy this book on Amazon UK: http://www.amazon.co.uk/gp/product/15...Buy this book on The Book Depository: http://www.bookdepository.com/The-Cat...Actual Rating: 4.5 Stars* The author of this book sent me this paperback copy in exchange for an honest review, so don’t expect less than that, I will always give my honest opinion, like it or not *When I was contacted by Brooke I accepted his book right away because I knew it was TOTALLY my type of reading… first of all, this book is about cats and I love cats, second, this is a Middle Grade/Fantasy book, a genre that I normally enjoy a lot and third, LOOK AT THE COVER.It took me some time to finish this book, more than I wanted to, not because I was not enjoying it, not because it is a slow reading (because it was totally not a slow reading, it was a really fast read actually), but because I had a ton of stuff to do the week I started reading this baby. I really enjoyed this book, I really enjoyed the plot and it was a really light and fast reading.Normally I have a hard time liking the characters from the books I read… yes, if you follow me on my blog, Goodreads or Instagram then you know what I am talking about… but this time I didn’t hate the characters, I didn’t dislike the main character, actually I liked him, quite a lot, I didn’t hate any of the characters of this story, I don’t know, it is strange, but I kind of loved everyone ! I MEAN, I was now thinking about it and sometimes I kind of rolled my eyes because of the main character’s mom (sorry, sometimes moms piss me off – moms that are characters of course, nothing against real life moms… I swear).This book had a really good vibe, I don’t know how to explain this to you, but it kind of reminded me of something that I don’t really know what it is… but it was kind of nostalgic for some reason, it made me travel, it made me smile… it made me feel like I was a child again.I really enjoyed the type of writting of this author, even if it was written in the third person I enjoyed it a lot and it was not boring at all (which normally happens, at least in my opinion, when a book is written in the third person, don’t really know why but I always prefer a book that is written in the first person). I enjoyed that fact that this book/story is really accessible to all ages, a “child” can read it, a teen can read it, an adult and even an old person can do it too (it will always depend on the person OF COURSE, and the age of the person, I am not saying that your great grandmother will read this book because she probably doesn’t even know how to read, I was just giving you an example and I was just trying to say that this book is really accessible)…LET’S JUST TALK ABOUT THE COVER OF THIS BOOK… I am really in love with this book cover, oh heavens… it is so gorgeous and the colors, and the cats, and the gravestones, and EVERYTHING’S SO PERFECT !… I am going to be honest with you, the first time I saw this book the first thing that caught my eye was the cover (I think that’s obvious). I am probably one of those persons who actually judges a book by its cover, and since I loved this cover I felt like I just had to read it really soon and I just thought that the book was going to be as awesome as the cover, and it actually was, I was totally right about that.Another thing I wanted to talk about are the illustrations… I was just blown away by the illustrations… every beginning of the chapter has a new illustration of a cat, and that illustration is related with the chapter that you are going to read… it is just WOW… that was one of the reasons why I was always so excited to read more and more, because I wanted to know what was the next illustration about (which, once again, made me feel like a child again).I totally recommend this book to everyone ! I hope you really enjoy it and I hope you get so excited as I got to read the second book, I really can’t wait to read it ! When Billy gets run over by a car, his prognosis isn't good. His leg is badly injured and it may not heal. Now Billy has always been plagued with bad luck but this is the worst thing to ever happen him. He is down in the dumps when a cat suddenly appears. The cat makes Billy feel better and he begs his mother to let him keep it. From that moment on, Billys life is changed forever. He is set on a quest to lift the Curse of his bad luck. Along with voices that promise him healing if he can open the gate, and the Vets daughter, can Billy figure out what is happening to his quiet life?This was not at all what I expected, in a good way. This was such a fast paced and fun book. My heart broke for poor Billy. He is cursed with bad luck and has no real friends. Yet he is such a sweetheart!! He is bullied by a neighbours kid and has pranks played on him all the time, yet it doesn't dampen his spirit. I so wanted to grab Billy in a hug!!! He is such a lovable character! 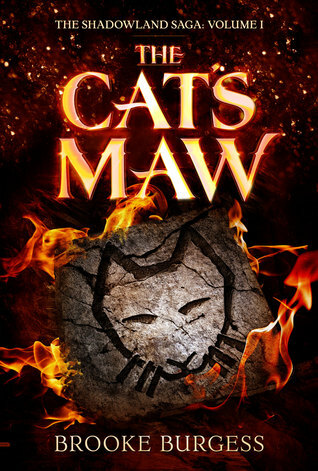 !The plot of The Cat's Maw was so fast paced and entertaining that I flew through the pages. I'm not much of a cat person but I always enjoy a great story!! The Cat's Maw is packed with great writing and even better story telling. I enjoyed finding out about Watchers, Shadows, and the Enemy that Awakens, it was all very intriguing. While at times this does pull on the heart strings, there is still some laugh out loud moments courtesy of Billy. There is also some pretty tense moments concerning him too!! Anyway, this was a tense and thrilling read and one I'm glad I got the chance to read. There is a lot left unanswered so I will definitely pick up the next to see if they are answered because I want to know what was the cursed cargo at the start and who is the Gray Man at the end?? In all a wonderfully written and adventurous read! I may be slightly(!) biased, but this is the singular most engrossing adventure of the past few years into which I've plunged, as a reader. I've a feeling it will gain momentum and expand into a gigantic worldwide phenomenon within months. I was completely transported into it from the first moment--and this is perhaps because the story of Billy and his sad beginnings are so grounded and evoke the long moments in childhood that we all have of loneliness and hopelessness, with no control over our destiny. I can't bring myself to spoil any of the incredible storytelling--but suffice it to say, the magical, often fearsome and deeply emotional journey is nothing less than FILMIC. I would not be surprised if within a couple years, this book is optioned for a motion picture franchise...! Though how in the WORLD they will possibly capture it all is going to be a feat of true magic!Two padded dewclaws WAY UP! From THE GUARDIAN (UK):"If you like cats at all, and adventure, and mystery, you will like this book. Also if you are the sort of person who sometimes enjoys being the first to know about something important, it's high time you read this. Because this is important. For brave young readers as well as their parents." Young or old, this book is not for the faint of heart…or mind…or soul. If you have ever felt alone, misunderstood, unworthy…if you have ever taken comfort in a four-legged companion or looked into its eyes and thought the answers to life’s most intrinsic questions could be found there, then you’re in for a treat.A highly intelligent, deeply emotional misfit, Billy Braham, the awkward and endearing ‘hero’ of this story takes us on an amazing adventure. In a curious mix of surrealism, fantasy, philosophy and gut-wrenching reality, Burgess’ beautifully written, often poetic prose weaves a compelling and thoughtful story. Unique and engaging characters, easy-flowing dialogue, vividly haunting imagery, foreboding and frightening escapades. As an adult, not only will it take you back to the fragility of your own youth but, it will ignite your boundless imagination.In a world where it often feels that judgement overwhelms compassion, where people hide their vulnerabilities behind a Veil, this book defies you not to look beyond the words on the page. This is not about the vilification of Billy’s antagonists, or even about the celebration of his triumphs…it is the deeper understanding of what roots all of their behavior…it’s about empathy…it’s about defying our perceptions and limitations.As his first foray into the world of children’s literature…Burgess has left an indelible mark and I am literally clawing at my collar for the next book in the series. Bravo! I won this book in a goodreads giveaway.I give this book a 4.5 out of 5 stars.O.M.G. A book I won that I actually enjoyed.Sorry, this happens so rarely that I always feel excited when it does.So the story starts off with 10 year old Billy getting run over by a car and then having freaky dreams and whatnot which leads to a grand adventure and tons of other fun things.Now, the storyline is good. Pacing is well done and I actually was okay with Billy despite some of the dumb choices he made along the way. The thing is, he did not FEEL like a 10 year old to me. Like it does mention that he skipped two grades so he is super smart but at the same time I didn't get the kid feel from him. Other than his parents doting on him, I kept thinking he was older than he actually was.The other characters are interesting as well. The parents are trying to be good parents but not really good at it at the same time(especially the mom). Lynn's a cool twelve year old(but I also felt like she was written older than she actually was...).This was really a setup for what's to come next. I have no idea where the story will go from here on out but I'm actually looking forward to the second book. It's bound to be interesting. :)Plus it features cats! The Cat's Maw begins like many adventures begin: in a fairly ordinary place. In this case it's Canada. Here we find little Billy Brahm, a boy who lives an utterly unremarkable life. Well, at least at the first glance. Actually like most people, Billy turns out to be a bit of an oddball. He spends a lot of time in his own room, lost in comic books and adventure stories, and does not have a lot of friends. He is also really unlucky. The story begins just after a terrible car accident that leaves Billy cast-bound and with morose prospects for the summer holidays. And then there are his adoptive parents who are not terribly helpful in cheering him up. He soon finds an unlikely friend in a cat though. And that's just the beginning. Because then, suddenly, all sorts of mysterious things start happening. Billy has strange dreams, more accidents, and then finds himself in a lot of danger. This is a very scary story and there are a great many parts that will make you feel quite sad for him, but you will also want to find out more. And this, again, is just the beginning! The Cat's Maw is the first book in a series of five. If you like cats at all, and adventure, and mystery, you will like this book. Also if you are the sort of person who sometimes enjoys being the first to know about something important, it's high time you read this. Because this is important. For brave young readers as well as their parents. Seemingly cursed by bad luck, Billy is recovering from the worst in a long series of accidents and is plagued by strange dreams. His enigmatical neighbor gifts him with one of her many cats which seems to help pass the time. But Billy is pursued by voices that want him to follow clues to find the key to release them. He begins to learn of Watchers, Listeners, and Shadows as he partners up with his vet's daughter. Meanwhile his parents aren't telling him the whole truth about his casted leg and what his diagnosis is. Can he solve the mystery in time and earn healing for his leg?I enjoyed this book and think it will be an interesting series. Children who like cats and dogs, who've been bullied, who struggle to relate to their parents, or who are maybe just a little different will identify with Billy. Action propels the story forward and even though it is a series, there is a satisfying conclusion to this book. As a potential, future 'Crazy Cat Lady' myself, I was really interested in reading Brooke Burgess's "The Cat's Maw". I was not disappointed. It is engrossing, well-written, vivid and interesting. I believe most readers will be able to relate to the protagonist, Billy Brahm, in one way or another, whether due to feelings of loneliness, feeling besieged by bad luck, etc.The Cat's Maw is easy to read and just the right size, not too short nor too long, for reading while on a trip, eeking out free time between classes, etc. On top of this, it also has Mrs. Thomas and all her kitties! It may be geared towards younger audiences, but there is enough substance to this book to win over older readers as well. I won my copy of this book from the Goodreads.com website and I appreciate the opportunity to read and review it. This could be one of the greatest books I've read from this genre. Because I have a teenage son, I've been through a lot of them and this is the first time I have ever come out the other side crying like a baby. Billy is wonderful, thoughtful, smart, brave and creative. His story, full of fantasy and adventure, is still, when it comes right down to it, the story of a clumsy boy navigating a world that simply won't stop throwing obstacles in his path at every turn. It's delightful to watch him get past each one, but it's also terrifying and heart-wrenching. It truly made me feel like a kid again. Won in First Reads giveaways.I liked this book. Some parts didn't make sense, but that's because it is the start of a series. I liked that it was dark and creepy, middle grade books could use some more of that. It reminded me of books I read when I was a kid. At first, I thought the portrayal of the mother was really harsh, but I got to understand her better. The descriptions of how fat the ticket taker got a bit harsh though. Or were at least overkill, like "mountain of pink". Like a little fantasy? Read this book. Like a little suspense? Read this book. Like cats? Read this book. Mystery? did you like the Narnia Series? Relate-able characters? Rich storytelling? Yeah? Then what are you waiting for? READ THIS BOOK. Thoroughly recommended, beautifully written fantasy novel that I'm sure a lot of us can relate to! Had me hooked from the start. An amazing plot, an intriguing problem, and interesting characters all intertwined into this breathtaking novel. two thumbs up. First of all mind my not so good English please, as they are not my native language. Let me start by saying, that it's been a while since I've read a book, as my time is very limited, and even more a children's book. When I was proposed to read The Cat's Maw I was interested in reading it but I was also kinda reluctant at first as the main character is a young boy and clearly I'm not and never been a boy. So what kind of connection or interest will I have about a young boy's story? Plus I was afraid that as it was written in English, it would be difficult for me to comprehend the story to its full meaning.Happily I soon discovered that I was wrong.This was of little importance and not only I had many similarities with the boy but I was easily drawn to the story and it was an easy read. Not tiring at all.The story is balancing between the dark and the light, it fluids with a great ease and it keeps you intrigued until the end. Cats are very important to the story and they give this mystical tone to everything. Though you empathise the boy yet you don't feel sorry for him and his continuous misfortunes, as he shows a great amount of spiritual strength and he is very mature and smart for his age. ( not all the times of course). His adventurous and curious nature, along with his great imagination and his sensitive soul that allows him to sense things that others don't, and his perception of the world around him, opens a door for a great journey to another land, another universe that helps him to strengthen in heart and to alter his way of life and thinking for the better. The message of the story is deep and strong and in the end it keeps you hungry for more. You just can't wait for the next book! Billy lives in the country with his parents. He is adopted. Billy is smart but is accident prone and friendless. He goes to visit his neighbor across the road who lives with several cats. Billy is attracted to a cat who goes to the middle of the road and sits down. Alarmed, Billy runs to rescue the cat but gets hit by a car. His summer is ruined!When Billy goes home with his leg in a cast, he gets a visit from his neighbor, Mrs. Thompson who convinces his parents that the cat will help him heal. Will the cat help him? While healing and under medication, he has nightmares about "the grey man" who talks about a key and curses him. Who is the "grey man?" Is Billy cursed? After wards, Billy gets stung by wasps. He knows that he is cursed. He has adventures such as meeting a vet and his daughter, a scary clown at a birthday party, and even at a bookmobile! While his dreams continues, he is aware of his parents keeping a secret from him.The novel is action packed, with thrills and chills. You get to know a ten year old boy who is sensitive and worried. The novel had me forget the rest of the world as I did nothing else but read the story. Lunch was forgotten and dinner was eaten at a very late time. I am eagerly waiting for the next book to read. This book is supposed to be a book for middle graders--I don't agree! It is for anyone who loves an excellent novel!Disclaimer: I received an arc of this book free from the author/publisher from Netgalley. I was not obliged to write a favorable review, or even any review at all. The opinions expressed are strictly my own. This is definitely a book for young readers who love cats - they'll fall in love with this story from the first page on. As to all other readers, they'll be pulled into a mystical, exciting tale that won't let go. The main character has a tough time with life; he's a bit prone to accidents and bad luck tends to peek in on him more than naught. He doesn't have a lot of friends and in attempt to keep him from totally falling into the anti-social abyss, his mom sends him out the door to "find friends". That he gets hit by a car, immediately pulls at the heart strings. Yep, Billy is a unlikely hero, which will automatically draw reader's sympathy. When cats come to his rescue, it's almost impossible not to fall into this intriguing world.The story keeps the reader on the edge of the seat. Some scenes are a bit gruesome, something I'd rather my own children didn't read, so that's why I'd definitely recommend this to someone first over ten. But this high suspense does keep these slightly older readers turning the pages and is guaranteed to keep them reading until the middle of the night. The writing is well-done and the dialogue believable. There were times that the story bounced around a bit (especially in the beginning), but all in all it created a dark atmosphere, which lures to suspense. In other words, grab the flashlight and blanket because this is a story which will make upper middle graders who love suspense (and cats) ignore their bedtime curfew. I received a free copy in exchange for an honest review. Reminiscent of Narnia and similar works in the fantasy tradition, this intelligent, engaging tale grabs the reader from the opening paragraph and doesn't let go until the final pages, leaving the reader wanting more. Although aimed at teen readers, this book is smart enough for adult readers alike, especially those who appreciate the genre. As I read it, I couldn't help but recall the many Stephen King novels I enjoyed as a young teen. Like King, Burgess tells a good story and seems to have found his own sweet spot: just enough creepiness to keep our imaginations churning, intelligent writing, and superb character development. And cats by the dozen!More than just a story with some creepy parts, the characters and themes are well developed and feel very real. The characters could be our neighbours, our classmates, ourselves. The universal themes of the outsider, of being different, of being misunderstood, of finding your way as a young person, are communicated with ease and are sure to resonate with most, if not all, readers. I have no hesitation in recommending this book to readers who would like to stretch their creative muscles and test the limits of their imaginations. A great read! Did I mention all the cats? Ten-year old Billy Brahm is so smart he’s going into the 6th grade. That is, of course, if he can survive his summer vacation. You see, Billy is “accident-prone” – or so his adoptive mother keeps telling him, over and over. A little sister he once had asked him if he was “cursed.” The answer lies somewhere between this time and space reality and another. Two weeks after his tenth birthday, while visiting his neighbor Mrs. Thomas’s cat collection, Billy followed a black and white tabby with golden eyes into the middle of the road where he was hit by a car. A mangled and broken leg would have sidelined any normal 10-year old. But the cat had other ideas. In Billy’s dream, the cat lures him into a shadowy sphere where a frightening creature begs for his help. Ordinarily Billy might’ve dismissed it as a nightmare. But when he wakes up and the black and white tabby’s golden eyes are staring at him from the chest in his bedroom, he knows this special cat is hiding a secret. From that moment on Billy is drawn, like a curious cat, into an unusual mystery that takes him on a journey into the realm of the tiger. “The Cat’s Maw” is a haunting fantasy not for the faint of heart. I really appreciate good writing. I'm talking about the kind of writing that spins you away from your own reality and takes you to a world filled with mystery, suspense and a strong connection to characters you can truly relate to. The Cat's Maw does this from the first page to the last, in fact I read the book in two days! Something else worth noting is this book does not fit my normal genre of books. I'm honestly not really into juvenile fiction. However one night as I found myself without a book (I read every night and can't go to sleep unless I read first) I borrowed The Cat's Maw from my 10 year old son. I was pleasantly surprised at the spectacular writing and was immersed immediately into Billy's story. I am very much looking forward to reading the rest of The Shadowland Saga! "The Cat's Maw" is truly a gem. Burgess deftly crafts each scene, each chapter, with nuance and subtly. Part of the book's mastery lies in it's darker passages - which at times are genuinely eerie - as they illustrate the protagonist Billy's mystical dream sequences and ethereal experiences with real mystery. Yet I believe that a hidden virtue of the book, is it's ability to be (often, and unexpectedly) humorous and poignant through description and intuition. Through the author's narration, I feel that I can empathise with Billy- I wince when he is hurt, I roll my eyes at the cringeworthy remarks of his parents (whom are often all too reminiscent of my own). Burgess gets kids, and his book doesn't patronise it's readers. More than anything, "The Cat's Maw" transports me into the world that it has cleverly formulated. I have a special love for the frequent (and delicious) descriptions of food! In all honestly, I wish that I could have read this as I was growing up. I purchased several copies of this book for my ESL students here in South Korea for Christmas. I was pleasantly surprised and encouraged when my students told me that they enjoyed the book thoroughly, as it usually takes a lot of prodding and cajoling to get them to read something in a language foreign to them. They were so engrossed in reading this time! My students particularly enjoyed the descriptive imagery, and the beautiful language that Mr Brooke Burgess used definitely helped them to improve their vocabulary. I also had fun using the book as a teaching resource for English. It also helps that the book is peppered with wisdom and sagely advice! We had many interesting lessons and discussions together about "The Cat's Maw"! My students and I are eagerly looking forward to the next installment in the Shadowland Saga series! The Cat's Maw took my son from picture books to prolific prose, and now there's no going back. We live in Norway, and heard about a kid's book that bridged the gaps between our lives, our dreams, and the mysterious existence of cats. I say 'mysterious' because when I think about a cat, I always feel that there's something 'extra' going on behind the scenes. Brooke Burgess lifts the curtain on this world, and shows us just how deep that rabbit-hole can go. The Cat's Maw is a fascinating read, that allowed me and my son to bond every night before bedtime. We would read a few pages each night, and we would both look forward to it throughout the day. Sometimes, Brooke would have us so reeled-in that the 'ten minute rule' was ignored, and we would keep on reading past bed-time. Mom would often come in and tell her boys to "wrap it up and go to bed" - only heightening the suspense for the next day's read! Inevitably, putting the book down would not lead seamlessly to bed-time either, as my son's curiosity about the story was awakened, and there would be questions, oh so many questions.. "What happens when we sleep? What happens when cats sleep? Why does our cat have golden eyes daddy?" It was wonderful to see just how engaged Jonas would become after we experienced the fantastic twists and turns we encountered in the first book of the Shadowland Saga.We have since finished the book, and the desire to jump into the next book is undeniable! In fact, if I am to listen to my son, we will not start a different book, but begin anew with the Cat's Maw. This is no great inconvenience for me, as I really enjoyed the story, but especially like the times it has given me with my son. We will await the next book with anticipation, and continue to see our world, our dreams, and our cats through a new set of eyes. Thank you Brooke Burgess! *Book provided in exchange for an honest review*Wow. I don't even know where to start! This has been a long journey for this book and me. From Kindle to paperback but I am so glad I didn't give up on it!Brooke's writing style is marvelous and mystical. He created a world no other author has come close to touching. The descriptions were so perfect I could practically hear them and feel them as I read.The characters he created are so unique (emphasis on 'unique') and easy to relate to, no matter your age or gender. The main character, Billy, is a delightfully eerie kid and there were times where I wanted to shove his mom aside (forcefully) and hug him and tell him how special he really is. He's younger than I'm used to reading but I loved every second of his experiences. My heart broke for him but he also gained my utmost respect. He never gave up on his strange journey and kept his humor in tact no matter how many times he was brought down. He has more courage than many real people I have met. The illustrations in this were fascinating! If I weren't already flipping the pages for the story, I would've been just to see the next picture! The build-up was so perfect and I was kept guessing the entire way. And that ending just broke me. Brooke, did you really have to hit us with that?! I honestly shed tears at the end. I wasn't a cat person before this but I think I'm being broken down.Anyway, I need the second book asap! I have to know what happens next... I miss these characters so much. This book has cats, what more does it need? Okay, so maybe a good story. Guess what, it has that too.This is the story of Billy Brahm and the strange and terrible things that happen to him. Billy is a 10 year old boy that seems to be cursed, nothing goes right for him ever. Except maybe (and this is a big maybe) when he meets a certain white and black tabby cat. In fact this meeting only seems to make things worse. Or does it?When I was young a cat was my best friend and often only friend so I know how Billy feels. Except mine never took me on adventures like this!This book is geared toward the YA crowd but that doesn’t mean adults won’t enjoy it.The only thing I did not care for too much were the dream sequences. Billy’s dreams (or are they glimpses into an alternate reality) are a little on the strange side (making them a little hard for me to follow and a little hard to get through), but aren’t dreams usually weird any way? I think some of the questions raised by this book will be answered in book two or others in the series to come.One finally note on my confusion and that was with the prologue. Prologues often do confuse me until somewhere inside the body of the work it is all explained or spelled out. But after reading this entire book I am still confused. I may have missed something, but I don't see how this fits into the story at all. I do look forward to reading the next book in the series. Brooke Burgess - BROOKE BURGESS was born in a tiny town on the eastern coast of Canada. After a youth filled with comic books, animation, and video games, he went on to receive acclaim for writing, producing, and contributing to groundbreaking interactive and multi-platform story projects. Cats had a presence in his home from the very beginning, quickly becoming his siblings, friends, and (benevolent) masters, and playing a role in many of his future works. Similarly, an old graveyard on a nearby hill was a real (and beautiful) thing in Brooke's youth, which probably influenced his love of scary stories. Brooke has written for videogames (Need For Speed, Kessen, 007), animation (Broken Saints), comic books (Becoming), and film. He loves mythology, travel, really good TV series, and frozen yogurt. Many of the events in his work (dream sequences included) actually happened.